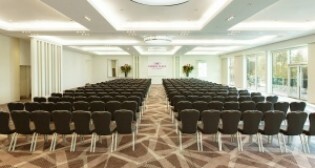 The purpose built conference suite located on the first floor is the ideal venue for meetings, weddings, large scale conferences and special events. The lakeside location of the hotel provides stunning views out over our lake and lawns making it an ideal conference venue for Marlow and the surrounding areas. 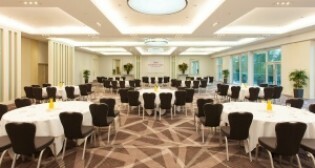 The Winterlake Suite is suitable for large scale conferences and events for up to 450 delegates. With stunning views over our lake and lawns as well as state-of-the-art lighting to suit the mood of your event. The room also has its own balcony area with access to the lawns below, an ideal area for team building events. As well as Winterlake, the conference suite is made up of a further 5 meeting rooms; Lakeside 1, Lakeside 2, Lakeside 3, Riverside 4 and 5. All our meeting rooms have natural daylight, high-tech audio visual facilities, air conditioning and some with full black out facilities. An open and informal breakout area with comfortable seating and access to its own outdoor terrace. Again, the floor to ceiling glazing provide excellent natural daylight with views over Winter Hill. The breakout area can be used for both drinks, buffet lunches, small exhibitions, syndicate space or even informal meeting space. The area also benefits from having its own bar, lift and washrooms.